For some ancient cultures, bathing was a necessity. Others avoided keeping clean for a multitude of reasons. For the Romans, not only were baths important for maintaining health, they were also an important part of social life. Roman public bath houses were centers for socialization and in some areas, were quite large and lavish indeed. 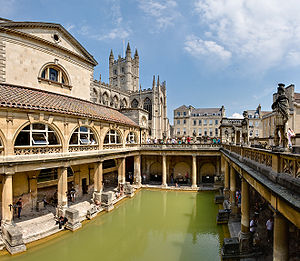 Roman baths actually fell into two categories: balneae and thermae. Balneae were built on a smaller scale than thermae. There were public balneae as well as private ones that were attached to homes. Their main function was to enable people to clean themselves. Although these were popular and the Romans did enjoy using them to get clean it was at the thermae that the action really happened. This is because thermae (some of which were large Imperial bath complexes) were much larger and were designed to allow a person to spend an entire day relaxing and getting clean. Some of the Imperial Roman bath complexes were absolutely massive. For example a public thermae that was constructed n 19BCE was a large complex that featured a 25 meter rotunda. It also featured a pool and an artificial river as well. Later complexes, such as the Baths of Diocletian were larger. Over 3,000 bathers used the Baths of Diocletian each and every day. A Roman bath complex featured three main rooms. Two of the rooms contained pools of water. There was a frigidarium, a room with a pool of unheated water. In some baths, the frigidarium pool was large enough for swimming. This was the room that bathers entered first and where they would disrobe. After plunging into the cold water, a bather could decide whether they wanted to enter the tepidarium to be anointed, or whether they wanted to move on to the caldarium. The caldarium was a room with a pool of hot water in it. It was built directly over a hypocaust. This was a form of central heating. A raised floor allowed hot air from a furnace to move around underneath and this warmed the entire room or complex. Because the caldarium was located directly over the furnace, the room was extremely warm and the water inside was very warm as well. 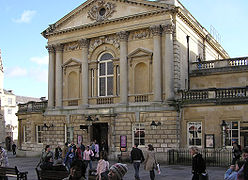 Although women were welcome at the baths they did not use the same rooms as the men. Their rooms were generally smaller and configured differently although they did serve the same purpose as the men’s bath did. Bathing was a process that could take hours. 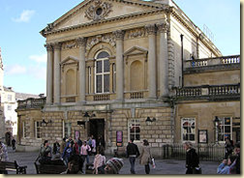 It was not uncommon for individuals to spend the day at the bath moving from one room to another. In some bathing complexes there were additional areas as well. One was the palaestra. This was an outdoor gym where men could exercise. Some thermae also had libraries and areas where food could be purchased and consumed. It was not uncommon for people to meet at the baths and make social plans or to us e the baths to find an audience for political speeches. As the Romans spread out and exerted their influence in other areas in Europe, they brought their baths with them. 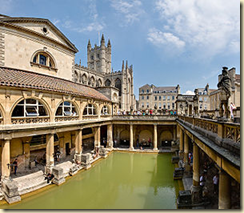 Some, like those built at the hot springs in Bath, England still have ruins that are visible today.